Let's dive in -- there's a lot to consider. 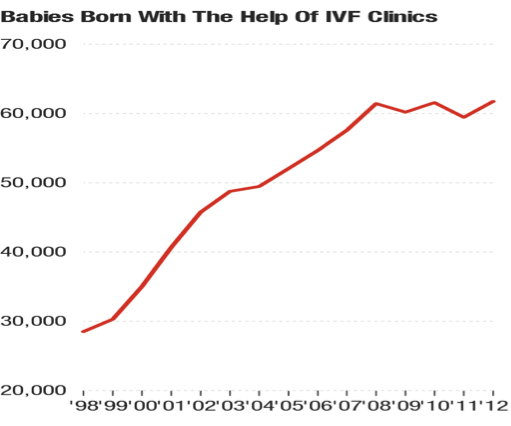 In 2014, more than 65,000 babies were conceived with the help of IVF representing 1.6 percent of the 4.0 million births in the U.S.
Over the past decade, the number of IVF procedures have skyrocketed nearly 50% from 113,000 in 2003 to over 165,000 today. IVF also allows couples to fertilize many eggs at a time (eight to 10 on average), grow them to the blastocyst stage, sequence a cell from each blastocyst and then select the healthiest for implantation into the mother's womb. I believe that eventually IVF might in fact be the "standard" and most widely accepted way to reproduce. 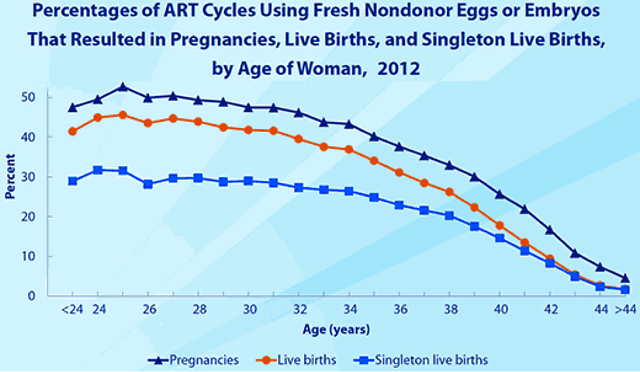 But one new technological solution might help solve this problem: the ability to freeze one's healthy eggs earlier in life. 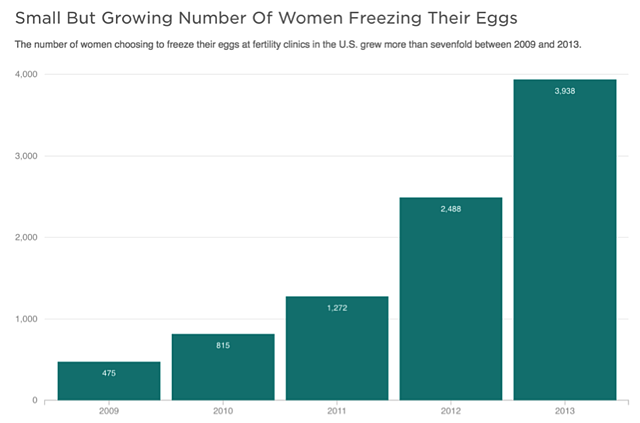 Egg freezing has started to become a way for women to reproduce on a timetable of their own choice -- not dictated by their own biology. Carl Djerassi, inventor of the contraceptive pill, commented on this trend, saying, "In the next 20 years, more young people will freeze their eggs and [sperm] in their 20s, and bank them for later use. They will do away with the need for contraception by being sterilized, and withdraw their eggs and sperm from the bank when they are ready to have a child via IVF." What if you could prevent a hereditary disease? Might it become 'unethical' to NOT correct genetic errors? Since we discovered CRISPR/Cas9, a tool used to "edit" the human genome with incredible precision, these questions are no longer theoretical and philosophical – they are very, very real. 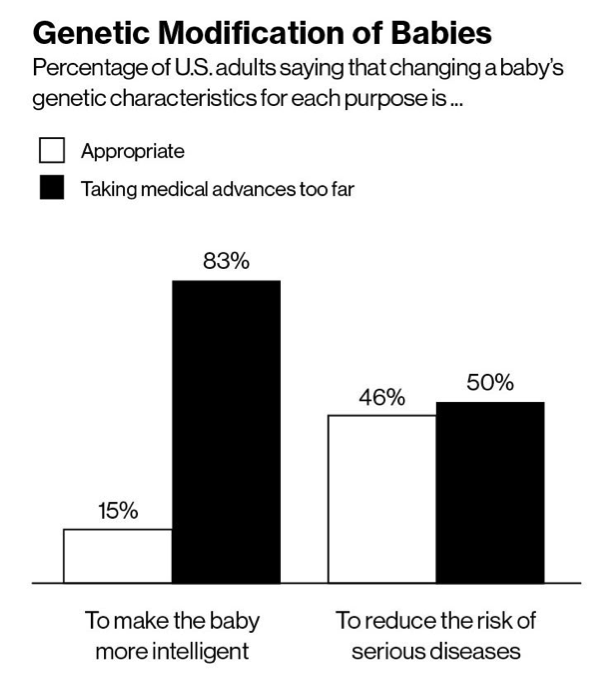 Interestingly, the same survey found that 83 percent said genetic modification to make a baby smarter would be "taking medical advances too far." At least three other centers in the United States are working on germline engineering, as are scientists in China, in the U.K., and at a biotechnology company called OvaScience, based in Cambridge, Massachusetts, that boasts some of the world's leading fertility doctors on its advisory board and has raised over $132 million. The objective of these groups is to demonstrate that it's possible to produce children free of specific genes involved in inherited disease. If it's possible to correct the DNA in a woman's egg, or a man's sperm, those cells could be used in an in vitro fertilization (IVF) clinic to produce an embryo and then a child. These changes are happening fast, in the next decade, or so… beyond that, in the far future, things get even crazier. These are moral and ethical issues – but in any case, it's clear that technology is forever changing the course of human development and procreation.